It’s almost hard to believe, but we’re mere days away from the arrival of Avengers: Endgame. It’s been a long year since Infinity War arrived in theaters, and left the public shocked as Josh Brolin’s Thanos took victory. In the meantime, we met Captain Marvel and The Wasp, although all eyes are on what the Russo Brothers’ upcoming blockbuster will contain, and how it’ll wrap up Phase Three. Avengers: Endgame has been teased to be the cumulation of the past 21 movies, with the Marvel Cinematic Universe as we know coming to an end in the process. Endgame‘s contents are almost a complete mystery, with the marketing material methodically releasing footage ahead of its release. The newest trailer paid tribute to each of the preceding blockbusters, and it’s enough to make some fans misty eyed. Check it out. I’m not crying, you’re crying. Avengers: Endgame has been a long time coming for Marvel fans, as cinephiles have put up a ton of money and actively followed the shared universe for a decade. 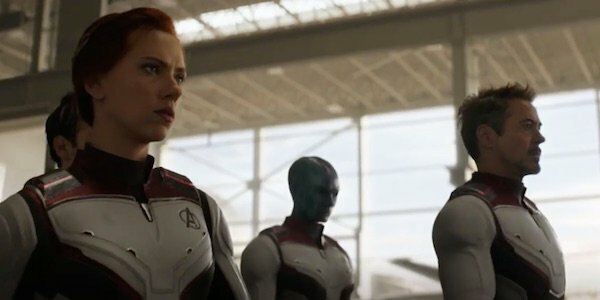 The above Avengers: Endgame trailer fails to provide any exciting new footage, but that doesn’t make it any less powerful. Footage from the past decade of filmmaking are seamlessly woven together, as the Marvel Cinematic Universe’s countless characters make appearances. The video’s narration is provided by a variety of characters throughout the MCU, and is edited together to make up one coherent monologue. The studio pioneered serialized storytelling, and this Endgame trailer is certainly no exception. It should be interesting to see how much Avengers: Endgame goes into the shared universe’s long history. This trailer seems to indicate an emphasis on the past, but it may just be a way to advertise the movie without giving away new footage. Still, the OG Avengers all managed to survive Thanos’ finger snap of death, so Endgame does appear to be going back to its roots in some ways. Avengers: Endgame has also been long theorized to include time travel, which should allow The Russo Brothers to really delve into Marvel’s tenure in theaters. While it’s unclear exactly how that could be done (the Quantum Realm? The Time Stone? ), early reports indicated the heroes would be returning to The Battle of New York from the first Avengers movie. We’ll just have to see if those rumors come to fruition. The surviving heroes have a ton of dirty laundry to unpack, as they grapple with half of Earth’s life suddenly fading to dust. Captain America and Iron Man have yet to repair their relationship, while Hawkeye seems thoroughly changed from Thanos’ snap. Nebula and Rocket are also in deep mourning, and Thor must live with knowing he didn’t aim for the head. All of the MCU has lead to this, and Endgame should be an emotional and epic final ride with the titular team of heroes. All will be revealed when Avengers: Endgame arrives in theaters on April 26th. In the meantime, fill out our Endgame death pool, and be sure to check out our 2019 release list to plan your next trip to the movies.